Swing and African Dance with Dance Instructor Shelby Jones! What a great turn out for Swing and African Dance with Dance Instructor Shelby Jones! Our after school kids got into rythm with Dance Instructor Shelby Jones of Rutland. Shelby Jones introduced the kids to some Swing moves and then took the kids to Africa. She brought along fabrics from different parts of Africa and the kids dressed up and immersed themselves in African dance. 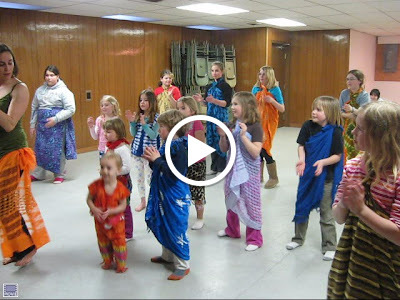 The kids learned how African dance moves often tell a story. So, while they were dancing, they were also giving thanks to the earth, praising their food, praying for rain, and loving their parents. At the end of the program, a circle was formed, kids got a chance to play the drums, and whoever wanted to enter the circle and dance was encouraged to do so, this was a fantastic program and a great opportunity for the kids to experience a different part of the world though dance. Shelby loved the energy of the kids and promises to return. Thanks Shelby! PS. I think this would make a great Adult program- let me know if you are interested. see the rest of Traci's photos HERE.